TEAM = Estes & Gallup as the GC., Judy Elliot as the Design Consultant and talented subcontractors put this project together. To mention a few: Darren Honey / The Ideal Board, Barre Tile, Vermont Custom Cabinetry. 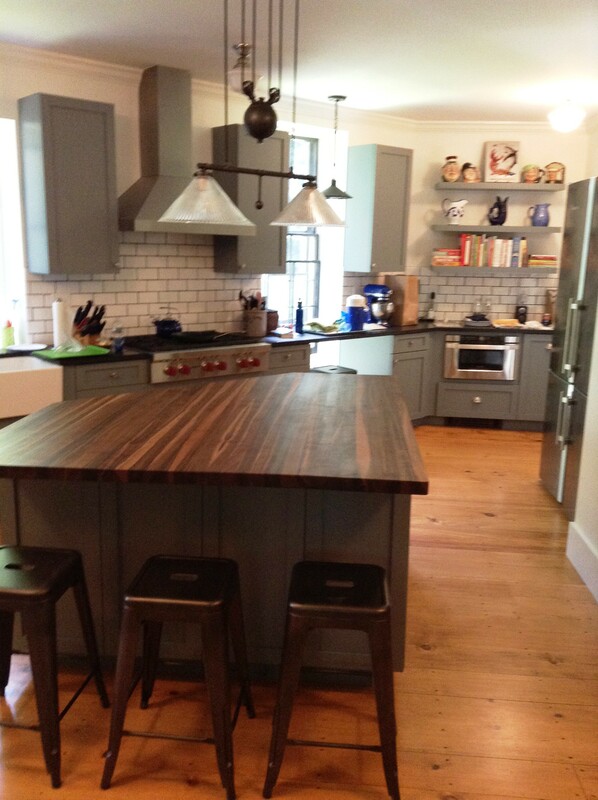 Custom cabinetry in paint grade, ben moore shaker gray (color-match). Frameless cabinet construction with shaker flat panel and 5 piece drawer fronts. Walnut Top for the island and absolute black (enhanced) for the perimeter. The wide pine flooring is a wonderful contrast and that farm sink? LOVE it. You know that beautiful kitchens make me smile and this one certainly does. Cheers! This entry was posted in Cabinetry, Countertops, Custom, Painted Kitchens and tagged absolute black granite, custom kitchen, walnut top. Bookmark the permalink.